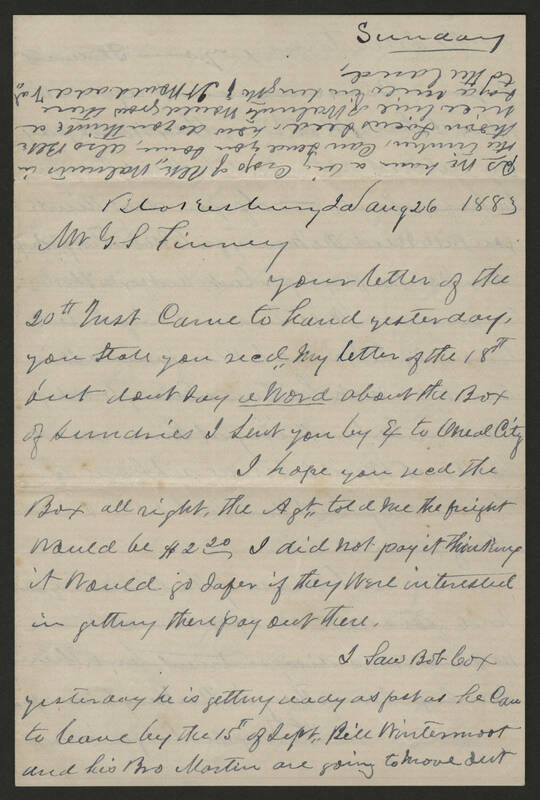 Sunday Blakesburg Ia aug 26 1883 Mr G. S Finney your letter of the 20th Inst came to hand yesterday, you state you recd my letter of the 18th but dont say a word about the Box of Sundries I sent you by ex to Oneal City I hope you recd the Box all right, the Agt. told me the freight would be $2.20 I did not pay it thinking it would go safer if they were interested in getting there pay out there. I saw Bob Cox yesterday he is getting ready as fast as he can to leave by the 15th of Sept. Bill Wintermoot and his Bro [Martin? Mortin?] are going to move out Ps We have a big crop of Blk walnuts in the timber, can send you some, also Blk thorn Locus seed. how do you think a nice[,?] line of walnuts would grow there say a mile[,?] in length? It would add val. to the land.